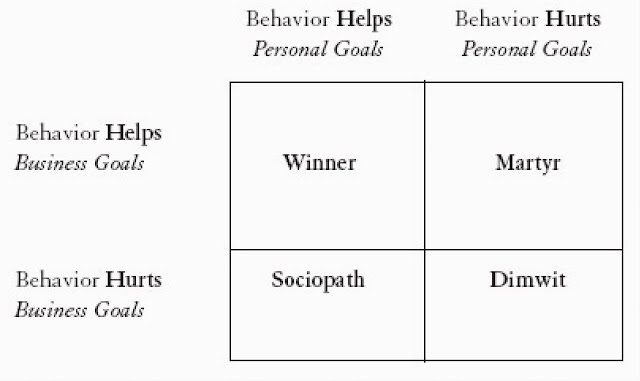 I am moving slowly with my reading of the office politics book and have found this quadrant useful to think about our behavior. You may think it's really dumb being a Dimwit, but if you were actually evaluating such situations in person, it becomes a sad reality that people do behave in ways that hurt themselves and the organisations they work in. And I realise that in my position as a HR practitioner, the actions I plan to take may need to be evaluated first based on the possible reactions from the Dimwits and the Sociopaths. The Martyrs would be blind to it and there may not be many Winners around. And more often than not, we will find ourselves in all these four positions in various times and phases in our lives anyway.